So The Legal Genealogist has time-traveled this week from the 21st century to the 16th. Were you along for the whole ride? Tuesday was the 21st century all the way in the APG-sponsored webinar on autosomal DNA — and if you missed it, it will be available down the road in the members-only section of the Association of Professional Genealogists’ website. A wonderful crowd with terrific questions — and some great input. And yesterday was the 16th century — and the 17th — and the 18th — with Jane E. Wilcox, during an hour-long look at colonial American women and the law. 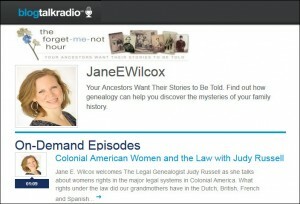 Jane is a New York-based professional genealogist and host of The Forget-Me-Not Hour: Your Ancestors Want Their Stories to Be Told radio show on WHVW 950 AM radio in Poughkeepsie, New York, and on the internet at BlogTalkRadio.com/JaneEWilcox. Yesterday morning, we spent an hour together on her radio program chatting about the rights colonial women had under the four major legal systems in effect in North America — in the Dutch, British, French and Spanish colonies, and the interview was rebroadcast last night on BlogTalkRadio.com. • What legal systems were in effect where in colonial America? • When did women arrive in the colonies? • What rights did women have under these legal systems? • What records were created under each system? • Where are those records today? The great thing about Jane’s programs is that they’re recorded and archived, so folks can listen on demand any time they want. The link to listen to this interview is here. So if you want to know why my personal opinion is that the absolute worst thing that ever happened to the women of colonial America was the fact that English common law won out in most places, and why women would have been much better off if they’d been wearing wooden shoes and speaking Dutch, come on over and find out more at http://www.blogtalkradio.com/janeewilcox/2013/05/02/colonial-american-women-and-the-law-with-judy-russell. Ooooh, yes. As a card-carrying feminist (and also a Renaissance literature person), I do want to know your personal opinion, so I have copied your link. It is on my to-do list to listen. Thanks!